In today’s marketing landscape, agencies are hiring and evolving their people into better and more effective marketers. And while it’s important to be doing great marketing work, it’s equally important to be delivering something your clients, partners and prospects will remember on an experiential level for a long time to come. Exceptional customer service. Doing great work and delivering results is expected. Beyond that, clients need to feel a connection that invokes loyalty and trust in your agency and your people. It starts with exceptional work and ends with exceptional customer service. A sustainable client relationship goes beyond results to inspire a deeper connection to the needs and goals of your client by providing a level of service that facilitates long-term, positive outcomes. While there are many elements that go into building a rock solid client relationship, I’ve chosen three core elements for building winning client relationships, outlined below. 1. Know what goals your client contact is being measured on. Then set expectations (under promise, over deliver) and go after those goals. These are the goals that matter most upfront from a relationship-building standpoint. While moving the overall business goals forward is just as important, knowing what your client is being evaluated on allows you to map out a strategy for their success. Your client’s successes are your successes, as are their failures. It’s important that your client knows you are looking out for them and working to help them reach their goals. Next, go the extra mile and push the limits of what your client has asked you to do and leave their business and marketing outcomes better than they were before. At Anvil, this is how we strive to elevate our client’s business by going above and beyond to deliver world class work and exceptional performance. 2. Be responsive and communicate. This principle can apply to virtually anything, as there is nothing more frustrating than waiting on a timely response from someone else. Or worse yet, being left in the dark completely about an important matter. The same rule applies to your client. Responsiveness, proactive communication and education sets the tone for the value you place on your client’s well-being and happiness. This is an opportunity to put your client first by responding quickly to emails or phone calls and demonstrating that you understand their time and needs are important. This is just good old fashioned customer service. But, it’s a mechanism that wins hearts and minds every time. Everyone loves a surprise now and then. By staying in-tune with what is going on in your client’s world, you will be well equipped to do so at just the right moment. At Anvil, this is how we strive to delight our clients by doing something thoughtful. It may be a housewarming plant, a bottle of wine, a birthday card or a thoughtful email sent at just the right time. Timing is everything. For the Anvil team, this means going above and beyond the expected to deliver the unexpected. 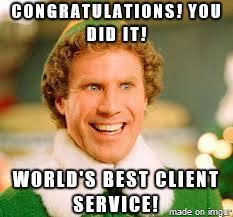 We don’t do this because we have to, but because making our client’s day makes our day. In short, if you demonstrate that you care and appreciate your client, you will create a personal connection and develop a lasting client relationship. At the end of the day, building a winning client relationship not only helps you do more inspired work and empowers your client’s success, but your client’s success helps to empower yourself as a marketer and elevate your agency. So how do you help build winning relationships with your clients, partners and peers? Please share in the comments below!